Paul and Marcia Simon are perhaps Charlotte’s original mom and pop business. 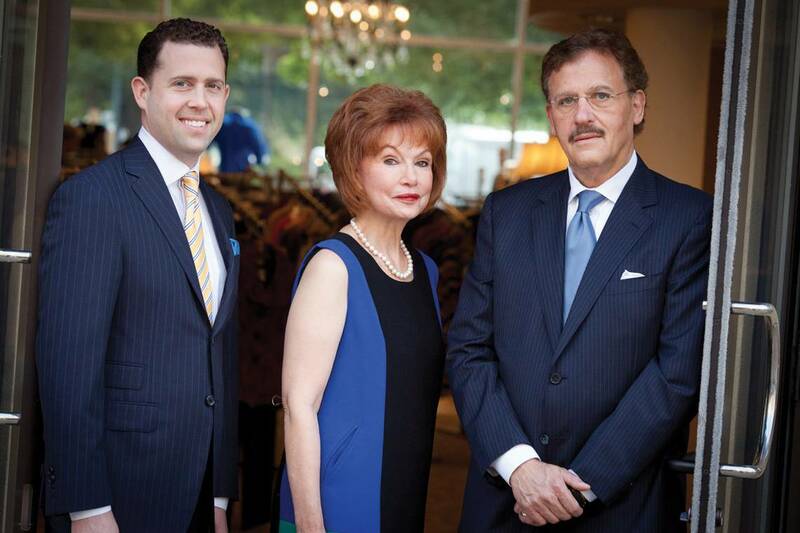 After launching a clothing store in Myers Park in 1975, they’re still going strong 38 years later as some of the most recognizable names in Charlotte’s retail scene. But they’ve changed with the times, and their most dramatic change happened recently, with the decision leave the store’s longtime location in Myers Park Center and focus on two locations – a men’s and women’s store – near each other in the Village at SouthPark, a center on the corner in front of SouthPark mall.Paul, who has made a name as a painter outside his clothing business, and Marcia, who has been a fixture in Charlotte’s arts community for 25 years (including stints as chair of the Arts & Science Council’s board and the board of the Levine Museum of the New South), sat recently for a conversation to discuss the history and evolution of their business. Their son Jonathan, who runs the men’s store, added his own thoughts soon after. Answers have been edited for clarity and brevity. I feel like I’m coming full circle here, because I remember we used to come out in kindergarten and see the turkeys at the Morrison Farm (where SouthPark mall now stands). The new women’s store is positioned with our big windows on Sharon Road; I grew up in Charlotte and I remember coming out here to go to elementary school. It was two-lane and there was nothing here, country road, just farm country. What was so amazing is that once the mall was built, it generated so much development. I grew up in a small town in western New York state. Marcia and I met at Syracuse. We got married in Ithaca, N.Y. I was in the hotel school, Marcia got a degree in teaching. We didn’t want to stay in New York because it was too cold. Because of the hotel business, we could really go anywhere. We wanted a city, and we wanted to have exposure to things we hadn’t been exposed to. We chose San Francisco, and lived there three years – that’s where our son Jonathan was born. In San Francisco at that time, you had people with doctorates driving taxicabs. Everything had been done, almost, or at least you felt that way. We wanted to go a place where good ideas would be welcome – where we could be entrepreneurs. We came to visit my father in Charlotte in 1974, and thought, Charlotte was changing. Charlotte was still to me a very Southern city. I was close to being a third-generation entrepreneur. Working for a large corporation didn’t appeal to either of us. I wanted to look for an opportunity, and our major hurdle was we had no money. That sort of narrowed the options. A friend mentioned that Providence Men’s Store in Myers Park Center was available. It had started in the 1950s. The owner had died. His wife was running it until she could find someone to take it over. It didn’t require a lot of money, so it was a perfect marriage because we didn’t have a great deal and it really was not in great shape then.At that point there was very little downside. My grandfather had had a dry-goods store that started in the late 1800s. It was different, old timey. I knew a little bit about it, but if anything that was a deterrent. I did not want to repeat history, but to move on. Myers Park at that point was a different place. The community was so much smaller. It was just a great place to start a business.I liked the idea of, even if I was in a big city, of being in a place where there was a sense of community. Also being my own boss. If I failed it was on my own, if I succeeded I was on my own. It had vinyl flooring, green and cream. They had a big stuffed fish on the wall. Also, there was a whole case of hats. They had that clientele. Men wore dress hats in the winter and straw hats in summer. The inventory was mostly polyester leisure suits in a panoramic array of colors. All synthetic, and we worried about a fire. (Laughing) One spark and the place would have gone up. It was just very bare bones. But amazingly, a lot of really nice people would come in, particularly after we got rid of the leisure suits. Lots of people wondered ‘Who was this Paul Simon?’ (Musicians Simon & Garfunkel were popular then, and later there was a U.S. Senator with that name.) They thought this must be a chain store. We were in our late 20s. To Marcia’s point about being young, people went out of their way to help us and overlooked a lot of ineptitude. They really lowered the bar for us for a while until we figured it out. The South is idiosyncratic so it loves its characters, and we had lots of them. It was like walking into a novel – or a “Saturday Night Live” skit. (One such character was Hugh McManaway, a neighborhood resident who used to stand at the intersection in front of the store, directing the passing traffic, and who is now memorialized in a statue there.) He would come into the store and fall asleep, and everybody looked after him. There was truly community. He was never unattended. It was the same with a lot of other people. Charlotte was a very conservative business community. They dressed nicely and conservatively for work. Then they had a parallel life for going to the mountains or the beaches for the summer. They dressed with a lot of color and Southern fabrics. The textile industry was still vital at that point, and cotton was king. We had a lot of families coming in from the small towns to shop, people from textile families, furniture families. Charlotte was – and to some degree still is – a conservative town because of the banks, but the banks also made it an international town. People came in from all over the world.At first after we opened in Myers Park, I was interested in wine so we had a wine shop. We tried a little of everything. We had the original store for 38 years. Paul had a second store that moved three times. It was in the mall for ten years, in Sharon Village and in Morrocroft. We put a store in the over-street mall in uptown, right by the elevators, and caught all the corporate executives coming in the morning. We had that one five years. Conservative means we weren’t like Dallas where everything is big. People had nice taste, and they took a lot of pride in how they looked, the men and the women. When they went out in public, there was some preparation. They took pride in how their clothes fit and how they were made. So it’s not a negative connotation at all. You would go into the doctor’s office, and the doctor would have a coat and tie on. You don’t see that today. People lived a more formal life. It was different from riding a subway to work. This was during the 1990s boom. We were very smart businesspeople in the ‘90s. (Laughing) We thought we were brilliant. There almost was no limit to what we could sell. It would be mind-boggling to us. It was almost hard to keep inventory in the stores. People would make huge purchases. You just wondered where they even put everything. It was a time of excess everywhere. Recessions come and go. There had been one in 1974-75 when we moved to Charlotte. Another one in the early 1990s. In the early 2000s, we had to get realistic. Our toughest time was probably 2008. We had customers who had been shopping with us for a long time, and in a lot of cases their income came from bank stock, and they were just wiped out. It was like getting a punch in the stomach. For others, their income was diminished or they lost their job or they were exported to New York or San Francisco. So we had to say, what do we do now? It had never happened in this community. We were very committed to keeping our employees, having them have a job, so we were very careful. We cut back a great deal on our expenses. We were able to get through that period of time. I think you have to make a philosophical decision: Are you willing to weather the storm? Are you willing to retrench? Are you willing to change? Each of our customers is devoted to someone who works here, who they have a personal relationship with. We try to foster that sense of family and community. It’s hard to differentiate yourself. You try to find people who enjoy other people and like to do what they do. It was never about what we did, it was about what we did with the help of other people. We try to make an environment where people like what they’re doing. They’re here just as many hours as they’re home with their family. And so it is a family. I think this is important. We respect one another. (Our son) Jonathan said he wanted to join the business. It’s hard work. We’re open six days a week. It’s not typically a way you’re going to make a huge amount of money. His indicating he wanted to come into the business changed our direction: How can we position the business so we can get what we need out of it, but also give him opportunity? We sent him to Nordstrom at Tysons Corner (in Washington, D.C.) to work for a year. He was the youngest guy on their clothing sales floor. (The Simons’ other son, Daniel, lives in Washington, D.C.) A sales floor, particularly in an urban area, is full of barracudas, and he was the youngest kid. They just were ruthless with him. Then they sort of became mentors and helped him. He came back and surprisingly said he still wanted to do it, so we said, ‘How do we make room for him, and make sure everyone has enough space?’ I didn’t want a family business that was full of family drama and conflict. We try not to talk about it outside of work. We do have certain rules. We have decided we will not discuss business at home. His perspective helped us sort of refocus. The very simple business reality is you do not have a constant customer because you’re dealing with someone who’s going through his own life cycle. Somebody at 65 is not as viable as a clothing customer as someone who hits 35, when you’re building your career. If your eye drifts off toward this older guy, the younger guys are not attracted to what you sell. So Jon’s been a great help in pushing both of us to make sure we weren’t just buying for ourselves, but buying for a healthier client base for the sake and welfare of the store. It’s a tough lesson. You learn it early on: you don’t buy what you like, you buy what the customers like.I saw they were building The Village at SouthPark right in front of the mall. It had drive-up access, which was really important for our customers. Men would rather not dress than go into the mall, and some women, too. The visibility was just unbelievable. The first two years in a new center, we were the lone ranger except for Crate & Barrel, which has been a great neighbor, but we didn’t have a lot of cross-pollination with neighboring merchants. It was Jon’s store, and he and his staff did a great job building it up over the years. The next crossroads came when our lease came up in Myers Park. It truly is a great center, but it is an insulated neighborhood center now. We weren’t getting the traffic from outside the neighborhood that you need to drive a business. On the men’s side, we cannibalized customers. We were only three miles apart. You very seldom see two stores that close together. It was more a quirk of history and development than good business sense. It just happened that way. It was time to upgrade, to decide, ‘Where do we want to make the investment?’ The Harris Teeter is expanding there, and we had to consider what was going on around the area, too. Harris Teeter is a plus and a minus, because they bring a lot of traffic, but typically they’re a destination – if you’ve got ice cream, you’re not going to shop (for clothing). A lot of neighbors would have preferred that we stayed. They also, like everyone else, do not like change. They need to be adventuresome and come out of 28207 (laughing). SouthPark is the largest regional center between Atlanta and Washington, D.C. The most important lesson I have learned from my parents is being willing to change and not being set in your ways. You have to constantly evolve. Our women’s store has had a niche. I call it a classic store with a twist. We don’t go up against young contemporary stores. But we do have things that are considered cutting-edge. It’s not all just tailored clothes. We have a wide variety of women, every size, shape and age, who come in here. We shop the market, and we must have 50 or 60 different vendors. It’s all in the mix of different items from different vendors.Our most popular are not ‘name’ labels. Not the Pradas and such. We don’t want to be like a department store. There are many lines that only sell to specialty stores. We do everything from Lafayette 148 to Magashoni; Belford; Italian lines like Santorelli; Nina McLemore. A lot of it is how you choose it. It’s everything for your whole lifestyle. We have jeans, T-shirts, we have things you can wear to the beach, work clothes, evening wear, travel attire. It’s how you put it together. I think Charlotte, like many cities, has its own look, and it’s part of the city’s identity. Not everybody makes an effort, and that’s kind of frustrating (pet peeve: flip-flops on men). There are a lot of good dressers in Charlotte – more people should catch on. The Charlotte look is more of a warm, approachable appearance, colorful, tailored. Jonathan is so easy to get along with. People have not necessarily given me the same compliment. To me they usually say, ‘Thank you for your candor.’ (laughs) I don’t think in our lifetime we have had a serious falling out. Every day I have someone tell me how wonderful Jon is. He’s just such a nice person. I call him my angel. Obviously we’re getting older, and we have to have some kind of plan going forward. We’ve seen family businesses where they really do not have a plan, which hurts the employees, hurts the rest of the family. You have to have a successorship plan. That’s really what we’ve been doing and talking about and structuring for the last couple of years. There’s a transition going on. 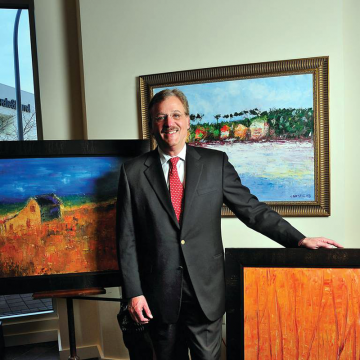 This particular business is a nice blend of personal relationships and art and business strategy. Working with my parents is a bonus. Both of us are grateful for the opportunity that Charlotte has given us. It looked like a great opportunity, and it has turned out that way. It’s been a great place to live and a great place to raise a family. I love going to a bigger city and all the cultural advantages of larger cities, but I always love to come home. The problems that happen in the community, there’s always a group here that addresses them. Always. I don’t know if you can say that about every community. Even with all the boosterism that you see, I think the city is well-grounded. It’s just a well-grounded place to do business and make friends and have a family. People put a lot of emphasis on being a good person and doing the right thing. And as corny and small as that sounds, it makes a difference. Paul Simon ArtPaul Simon Co.